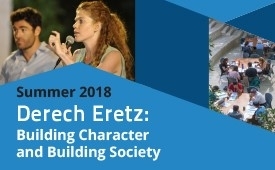 More than 130 participants joined us this summer for a timely exploration of character development and ethical leadership in the Jewish tradition. They discussed how our societies in America and in Israel are falling short of achieving our ethical aspirations. The demise of civil discourse, widespread cynicism about democratic principles, and misbehavior by flawed leaders were a few of the central symptoms of this gap between our professed values and our lived reality that were discussed. Speakers, panelists, and participants discussed how Jewish values can inform our conversation about the dilemmas posed by this widening gap. Click on the video player above to begin playing Derech Eretz videos. Click here to access the complete playlist on the Hartman Institute YouTube channel. The Community Leadership Program (CLP) is Shalom Hartman Institute's annual summer program for a diverse group of lay leaders from across North America. Participants join senior Shalom Hartman Institute scholars in Jerusalem to explore foundational Jewish ideas and central dilemmas of contemporary Jewish life. This intensive week-long, text-based study seminar features leading scholars in Bible, Talmud, Jewish philosophy and theology, history, and mysticism. Each summer has a theme from Jewish tradition around which texts and ideas are arranged. The study seminar attracts a wide range of adult learners - synagogue board members, Federation lay leaders, and activists in Jewish organizations - interested in a week of pluralistic, open-minded, intellectually rigorous Jewish study. The program strengthens and expands the intellectual horizons of community leaders, enabling them to respond more meaningfully to the contemporary issues and challenges facing Jewish life. The faculty includes leading Hartman Institute scholars such as Donniel Hartman, Yehuda Kurtzer, Dr. Ruth Calderon, Micah Goodman, and Melila Hellner-Eshed, in addition to other key figures in world Jewry. For more information on the Community Leadership Program Summer Retreat, please contact Tova Serkin. Watch videos from Summer 2013 here. Watch videos from Summer 2012 here.